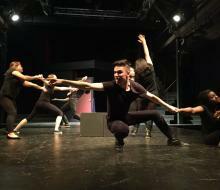 This new choreography devised by graduate student Brandon Gonzalez and produced by ITDP plays in the Arena Theatre, Wright Hall. The Space Between is an ongoing choreographic exploration into the sense of space and human relationship. Three performers attune to one another, they change the space and the space changes them. Together the dancers wait, and the complexities of desire, anxiety, and society arise. Lindsay Beamish and Amanda Vitiello. This stilt-walking migration commences at 5 p.m. at the Egghead sculpture outside of Wright Hall, then crosses the Quad lawn and concludes at approximately 6 p.m. at the southwest outdoor corner of the “Death Star” Social Sciences & Humanities building. Open to the Public/Suggested donations at the door. a political and ecological allegory. breathing and feeling and choosing to keep breathing. a non-narrative partially participatory physical theatre show. once you turn upside down, rightside up is not the same. the climate has changed, how shall we? Duskin Drum is a doctoral candidate in Performance Studies at UC Davis. There is no audience for this event. Project participation is by invitation only for UC Davis students. Dead Man’s Cell Phone is an imaginative comedy by playwright Sarah Ruhl, a MacArthur Fellowship recipient. It reveals the lives of ordinary people through their cellphone conversations and one woman’s need to connect in a technologically obsessed world. The production design draws from the art of Edward Hopper and Lillian Warren.